I want people to drink my wines and think about these mountain ranges, unique and untouched. Cederberg Private Cellar is owned by The Nieuwouldt family who have been farming for five generation since 1893. David Nieuwouldt, the latest in the long line of wine makers, started making wine on the farm in 1997. 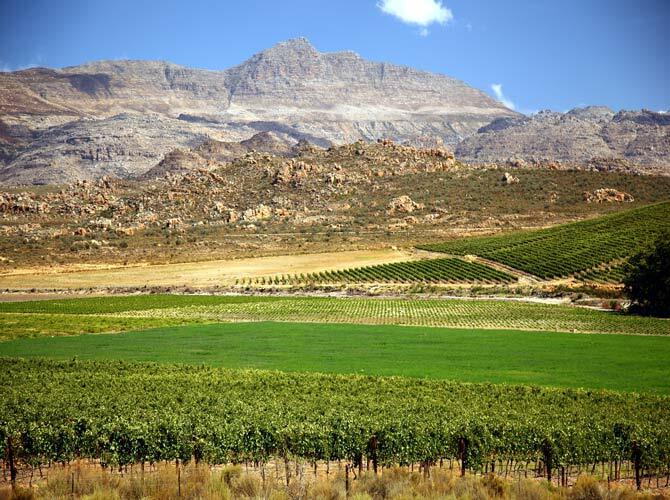 At an altitude of more than 1 000m above sea level, Cederberg Private Cellar is South Africa’s highest winery. There are also Yellow-brown soil of granitic origin, and lightly structured soil with sandstone, well suited to white cultivars. A premium wine in the Cederberg range, only 3400 bottles produced every year. The 18 months of maturation in new French oak has intensified the rich aromas of blackcurrant and cassis, layered with decadent dark chocolate and cherry tobacco. A velvety texture that lingers on the palate with a distinct blackcurrant aftertaste. A ripe tannin structure from the grapes hanging up to 18 days longer in the vineyard, gives this wine the potential to mature for many years to come. This wine was produced from a single vineyard block. Nine selected barrels were used to produce 360 cases. Delicate aromas of honey, lime zest, roasted nuts and peaches laced with sweet vanilla undertones. Wellintegrated wood and ageing on the lees developed a full, rich palate with a smooth lingering finish. This Chenin Blanc is concentrated and structured for longevity. An elegant well crafted wine. A complex Shiraz filled with intense red fruit, mulberry and cherries on the nose. Well-balanced with elegant oaking expressing hints of sweet spice and vanilla. Red berries follow through on the palate and finishes off with a smooth lingering sensation. A well-crafted Shiraz that allows you to cellar the wine for a few years developing into a sensational wine. Pair with South African game, powerful cheeses such as young cheddar or gruyere or indulge by pairing with intricate dark bitter chocolate. High altitude cabernet vineyards that have a longer ripening period give rise to this phenomenal wine. Loads of blackcurrants with cedar wood undertones on the nose. The elegant oaking expresses hints of smokiness and tobacco leaf creating a complex wine with a velvety finish on the palate. A prime example of a well-crafted South African Cabernet Sauvignon. A fantastic blend of 62% merlot and 38% shiraz. The wine shows an abundance of red fruit on the nose. Sweet plums and earthy black currents from the merlot and a slight hint of spice from the shiraz. A wine that is very accessible and smooth with fruity flavours lingering on the palate. This red blend is a must with every braai, but also suited to rich game dishes. An aromatic Sauvignon Blanc with grassy notes, white asparagus undertones and strong hints of capsicum, gooseberries and lemon zest. A refreshing, crisp acidity finishes off the initial sensation of creaminess on the mid-palate. The ideal companion to traditional chicken pie, but also try it with shellfish or pork. The Cederberg style Chenin Blanc offers beautiful layers of melon, grapefruit and fleshy white pear. Five months lees contact ensured a mouth coating creaminess on the palate with a lively crisp acidity to finish off. Altitude vineyards make this Chenin Blanc truly unique. This wine will be well suited to creamy dishes as well as light summer lunches. A rare cultivar with 77 hectares remaining left in the world. Cederberg Bukettraube is an explosion of aroma and flavour. It has prominent muscat flavours with apricot and floral notes on the nose. A well balanced wine with a delicate sweetness and a crisp acidity. Enjoyed as an aperitif; partner to spicy fusion foods – not hot; sweet Cape curries, or goose liver and baked fruits. The Cederberg Rosé, made of single vineyard shiraz on sandstone soil, shows elegant aromas of strawberries, watermelon and cotton candy. It has a dry entry with a creamy palate yet it has a crisp finish. This shiraz-based Rosé has an exotic coral pink appearance, a real summer refresher! “Strings of dainty pearls in liquid gold.” Made in the traditional French method of allowing a second fermentation to take place in the bottle. The extended period on lees, allowed time to add to the creamy complexity of this sparkling wine. It resulted in a bouquet of baked brioche, apples with fresh lemon and grapefruit aromas, enticing your senses. A vibrant sparkling wine with a crisp and integrated acidity. This Blanc de Blancs is to be savoured on any memorable occasion. A Merlot filled with red fruit of plums and mulberries. A mediumbodied wine with delicate fruit flavours that linger on the palate, soft ripe tannins that lead to a smooth finish. A wine suited for any occasion and can be enjoyed now or up to 4 years. A Sauvignon Blanc filled with aromas of tropical fruit flavours such as gooseberries, also hints of white pear with grassy notes coming through. A crisp wine with lingering fruit flavours and a mouthwatering zesty lime acidity. This wine would be welcome at any occasion and will be a great companion to seafood dishes, poultry or any lunchtime get-togethers.